Q: How heavy is concrete? A: Approximately 145 # for each cubic foot. A full 5 gallon pail is about 2/3 of a cubic foot it will weigh almost 100 #. An average size wheelbarrow will weigh about 500 #. A cubic yard (27 cubic feet) weighs almost 2 tons. Q: What about the delivery vehicle? A: All mixers in our fleet are tri-axle, rear discharge configuration with a payload capacity of 10 cubic yards. They are 12’ 3” high, 8’wide (wheels), 10’ wide (mirror to mirror) and weigh in excess of 70,000 # when fully loaded. Q: What is the length of the truck’s discharge chute? A: The trucks are equipped with 15’ of extension chutes. Q: Do you provide labor to install and finish the concrete? A: No, however we can recommend concrete contractors to you if you request. 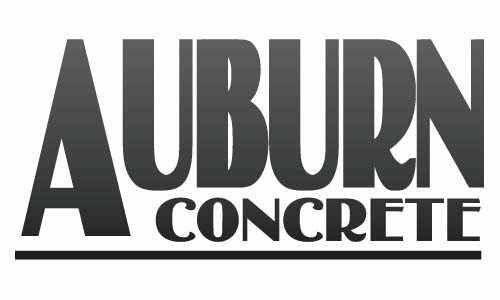 Q: Does Auburn Concrete provide tools / equipment to place and finish the concrete? A: No you will need to provide wheelbarrows, coal chutes, shovels, rakes, straight-edges, bullfloats, hand floats and trowels. Q: Does Auburn Concrete provide concrete with air entrainment? A: Yes, considering the climate of our service area all concrete is produced with air entrainment unless specifically requested otherwise. Q: Does the purchaser need water for mixing or wash-up? A: No, the mixers are equipped with a pressurized water tank for these tasks. Q: How much notice is required for scheduling deliveries? A: As much as you can afford is best but usually 24-48 hrs is sufficient to secure a spot in the schedule. Q: Does Auburn Concrete produce concrete in the winter months? A: This term is an acronym for “Pounds per Square Inch” and relates to a strength level used in formulating the actual mix proportions. Normally, residential concrete is designed for 3,000 PSI unless there is a unusual application or exposure condition. Q: What are common obstacles or site conditions that prevent delivery? A: Septic systems, leach fields, water wells, utility trenches, flowerbeds, tree limbs, low wires, curbs steep grades, neighbor’s property lines, swimming pools, excavation debris, newly installed paving, wet spots (clay) and quick sand. Q: If the obstacle can’t be moved are there ways to overcome the obstacle? A: Coal chutes (available a local tool-rental shops), wheelbarrows (have plenty of help), concrete pumps. A: Yes, there are several concrete pumps in our area. They can be truck mounted with 120’ long placement booms or trailer mounted ground line pumps.